Sometimes, there’s nothing better than just throwing on boyfriend jeans, a loose tee and loafers for a no hassle, no brainer look. Love this look! Such a great combo! That denim is perfect! This is a great weekend outfit! Love it! Such a pretty and stylish outfit! Perfect tee and shoes! Love the touch of color in the shoes :) and the bag’s patern is one of my favorite. You pull off boyfriend jeans like no other! Your relaxed looks are my favorite. 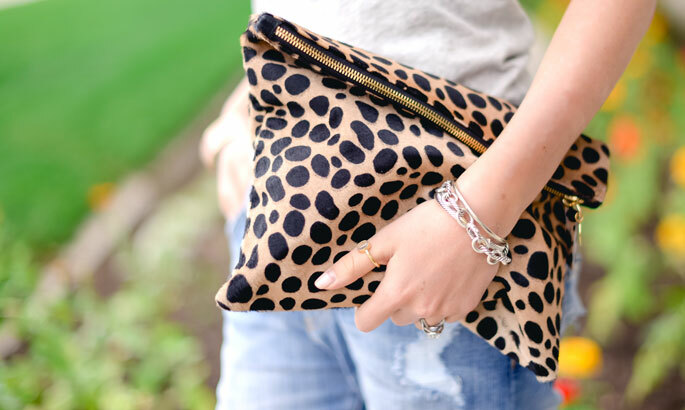 Sometimes..that all you need jeans, tee,leopards print…and your good to go! Love this! Such a sweet look! Those shoes are darling! Loving those shoes. Stripes and leopard print are my favs!! 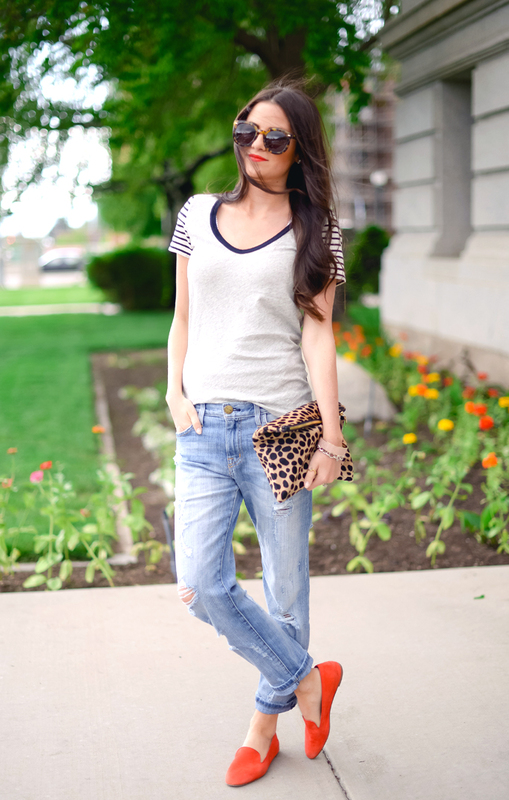 Love this relaxed look… I totally agree that you cannot go wrong with boyfriend jeans and a tee. Current Elliot is the best and those loafers are so, so comfortable. I have them in black, but love that pop of red! Great outfit! This is such a great everyday outfit! Does the t-shirt run big or small? I’m normally a small.. I love the pop of orange! Those J Crew loafers complete the outfit. Cute casual look. Loving the red loafers!!!! What a fun look! Love the t-shirt and jeans! Great casual look! I love those loafers! Functional and stylish! I am wearing the same sort of thing today! Boyfriend jeans, a simple v-neck and flats are the perfect ingredients for a lazy day! My favorite outfit to pull together. Those jeans look great on you! Uh oh! Looks like you got a bit of a sunburn on your arms. Gotta use that SPF! Relaxed and chic! Love it! This look is so casual and fun! I’m loving the bright loafers! I seriously LOVE your style. It is exactly how I want my style to be. From your dressed up looks to your casual- you ALWAYS nail it in my opinion and inspire me every day! Love the simple look! Those sunnies are very on trend. I love your boyfriend jeans, this outfit is so cute with mixed patterns! Love it when you keep it simple like that! The accesorising of the outfit is perfect! Clutch and shoes are amazing!!! The perfect casual look! The pattern combination and pops of red make this relaxed look so chic! You look beautiful, Rach! As much as I love fancy outfits, casual ones are my favourite to see on blogs because that’s what I end up wearing more often than not! Loving this laid back, casual look on you! Looks so comfy! Love the combination of red and leopard together, they add so much sass and character to any look! Totally cute weekend uniform! I love the way those boyfriend jeans fit you! I actually like the little touch of color you’ve added with these shoes. Love this casual look! Great top! You look so cute and comfortable! I’m in love with your shoes! Such a pretty color! I love these more casual posts. They are relatable and more my style. You look great, Rachel!! Red and leopard looks so good together! Love everything about this. The orange shoes are my faves. I absolutely love how you accessorize basic outfits to make them fresh! nice shoes. everything is simple but also stylish. Yes! Finally someone writes about makeup korea asli.